Apply to be a part of SPNN’s Youth Intern Program! 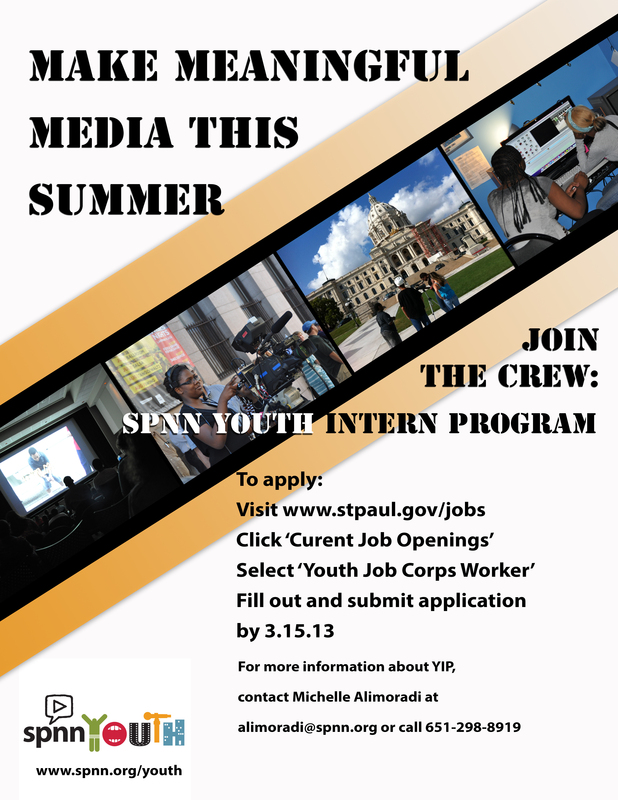 The SPNN Summer Youth Intern Program is an intensive paid training program where St. Paul teens work together to make meaningful media about community issues. This program provides young people entering grades 9-12 with hands-on media production experience. Interns learn camera operation, interviewing, and digital editing to create their own short documentary videos. Watch this video to see some of the fun interns had last year. No prior media production experience is necessary, interest/experience in community activism is a plus. Bus passes and daily snacks are provided for all members of the crew. All interested youth must have already applied to and been accepted by Youth Jobs Corps. More info here. Previous Previous post: TCYMN Youth Media Market & Screening: Feb. 16 @ Intermedia Arts!